Mesothelioma is caused by inhaling asbestos fibers. The risk factors for developing mesothelioma include working in an asbestos plant or working with asbestos products. Smoking is not a risk factor by itself but can further the damage done by asbestos exposure. Dr. Jacques Fontaine talks about the different people who are at risk of developing mesothelioma. 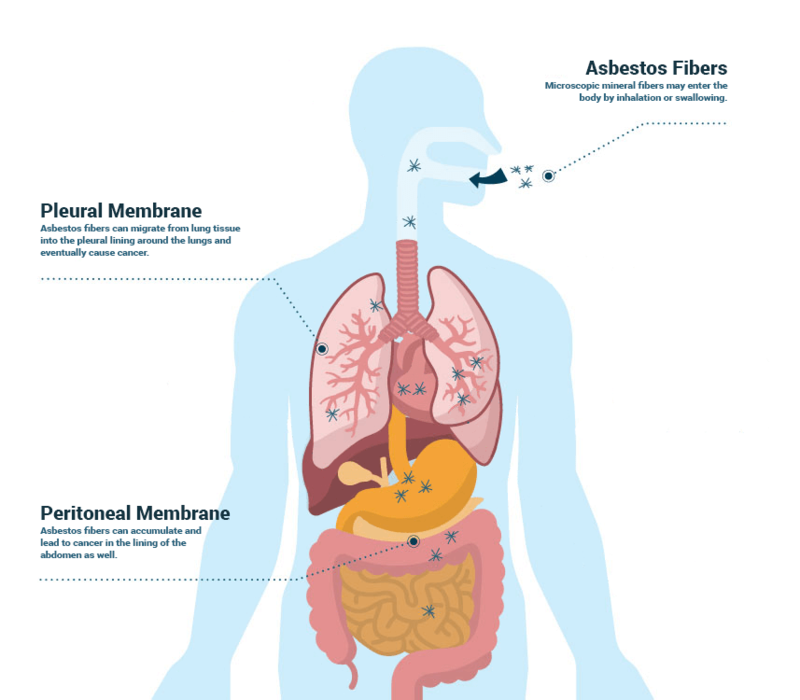 When airborne asbestos fibers are inhaled, they can get into a person’s lungs. The fibers can lodge into the pleura (lining of the lungs) which causes inflammation and scarring. Over time, the damage affects the DNA of cells and can cause mesothelioma cancer. When the fibers travel to different parts of the body, it results in different types of mesothelioma. Mesothelioma was virtually unknown until the 20th century. After decades investigating the disease, medical researchers identified the cause: Asbestos exposure. Mesothelioma rates rose as industries expanded the use of asbestos. Diagram of mesothelioma causes by location. Research studies proved inhaling or swallowing microscopic asbestos fibers can start a chain reaction that leads to several types of cancer. The toxic dust can also cause asbestosis, an incurable breathing disorder. In March 2009, the International Agency for Research on Cancer (IARC) reconfirmed asbestos exposure as the leading cause of mesothelioma. All forms of asbestos cause the disease. Two years later, the IARC presented an update on the link between asbestos and cancer at a World Health Organization conference in Spain. They explained the scientific evidence has strengthened over time. There is now overwhelming proof asbestos is carcinogenic to humans, regardless of the type or fiber length. Once asbestos is inhaled, the body has a hard time getting rid of the sharp fibers. These fibers eventually build up in the lungs or abdomen over time. After many years, these fibers may cause cancerous changes. Cancer starts in mesothelial cells, which comprise the protective membranes that cover the lungs, abdomen and heart. Tumors tend to form a sheath around the affected lung. Inflamed Cells: Fibers inflame and irritate mesothelial cells, which leads to irreversible scarring, cellular damage and cancer. Genetic Changes: Fibers enter mesothelial cells and disrupt their life cycle, causing genetic changes that lead to cancer. Cancerous Mutations: Asbestos causes the production of free radicals, which are molecules that damage DNA and cause healthy cells to mutate. Uncontrolled Growth: The fibers trigger the production of oncoproteins, which block genes that protect cells from growing uncontrollably and forming tumors. Mesothelioma has a dose-response relationship to asbestos, which means higher doses of asbestos exposure lead to a greater risk of developing mesothelioma or another asbestos-related disease. In 2012, mesothelioma specialist Dr. Michele Carbone, director of thoracic oncology at the University of Hawaii Cancer Center, co-wrote a scientific article detailing multiple ways asbestos may damage the body. Chronic Inflammation: Fibers can inflame and irritate mesothelial cells, which leads to irreversible scarring, cellular damage and cancer. Cell Life-Cycle Disruption: Fibers can enter mesothelial cells and disrupt their life cycle, causing genetic changes that lead to cancer. Cancerous Mutations: Asbestos can cause the production of free radicals, which are molecules that damage DNA and cause healthy cells to mutate. Uncontrolled Growth: Asbestos fibers can trigger the production of oncoproteins, which block genes that protect cells from growing uncontrollably and forming tumors. Every healthy cell has genes that regulate growth and safeguard against cancer. Once asbestos blocks this function, cells can divide uncontrollably, causing malignant tumors to form locally and possibly metastasize — spreading throughout the body and forming metastatic tumors. Metastatic tumors develop relatively late in the course of mesothelioma but may be a patient’s main source of symptoms. While all types of asbestos cause mesothelioma, certain types, such as crocidolite and amosite, are especially dangerous. Researchers believe the varying chemical composition of the different asbestos types makes some asbestos more carcinogenic than others. The majority of people who work with asbestos will not develop a disease, but individual factors might lead to a diagnosis. For example, genetics play a role in mesothelioma development. And smoking cigarettes can increase the risk of asbestos-related lung cancer. Exposure to other fibrous minerals such as erionite. Receiving a polio vaccine between 1955 and 1963 that was contaminated with simian virus 40 (SV40). Genetic mutations that increase the likelihood of developing cancer. Mesothelioma is more common in men than women and it rarely affects people younger than 45. This is because mesothelioma often takes decades to develop, and men are more likely to work in jobs where asbestos exposure occurs. Free information, books, wristbands and more for patients and caregivers. Is Smoking a Risk Factor for Mesothelioma? Studies show smoking is not a risk factor for mesothelioma, but those who smoke and are regularly exposed to asbestos are much more likely to develop asbestos-related lung cancer. Some studies reveal the combination of smoking and asbestos exposure raises the risk of lung cancer by approximately 90 percent. Researchers also found smoking can weaken lungs and reduce the body’s ability to dispose of asbestos fibers trapped inside. Smoking also aggravates asbestosis. A risk factor is anything that increases the odds of developing a disease. A cause is the contributing factor that leads to a disease. For example, although men are much more likely to develop mesothelioma than women, gender alone cannot cause the cancer. Often, multiple risk factors are involved in the development of mesothelioma. The duration of asbestos exposure plays a key role. While the World Health Organization says no amount of asbestos exposure is safe, it is usually heavy, repeated exposure over many years that leads to asbestos-related illnesses. A study in the American Journal of Epidemiology found the longer someone works in a job that involves asbestos exposure, the higher their risk of mesothelioma becomes. Dose-Response Relation at Low Levels of Asbestos Exposure in a French Population-based Case-Control Study. The link between asbestos exposure and mesothelioma is so strong that it can be difficult for researchers to tell if any other risk factors can cause mesothelioma on their own. Although scientists continue to study this topic, exposure to asbestos remains the most clearly defined cause. Where Does Asbestos Exposure Occur? Asbestos once filled countless U.S. homes and businesses in the form of insulation and fire-resistant materials. Throughout the construction boom following WWII, asbestos was a key element in thousands of industrial and household products. Examples include drywall, wiring, glues and adhesives, ceiling tiles, cement and shingles. Workers were exposed to the harmful natural mineral while on the job. Others, including workers’ family members, faced secondary exposure at home. Environmental exposure happened in communities that mined or processed asbestos. Some asbestos products remain in old structures and are usually harmless — as long as they’re not disturbed. Firefighters, contractors, demolition workers, electricians and plumbers are at high risk of exposure to asbestos in old buildings. Asbestos removal is highly regulated, and the government fines people and businesses who ignore the rules. Workplace asbestos exposure is still a hazard at job sites where safety procedures are not followed. The risk for asbestos-related illnesses is highest for people who worked with the raw mineral or with asbestos-containing products on a daily basis. Construction tradesmen and firefighters can be exposed to asbestos while working in old homes and structures built with contaminated materials. Exposure can happen during a renovation, demolition or disaster response. When old buildings are destroyed without safety precautions, airborne asbestos fibers can contaminate the surrounding area. When the asbestos industry was booming, families of workers were also at great risk. Workers often came home with asbestos fibers on their hair, work clothes and tools — exposing family members to the toxic substance and increasing their risk for related diseases. In 1995, the National Institute of Occupational Safety and Health (NIOSH) presented a study of “Workers’ Home Contamination” to Congress. Because asbestos is a naturally occurring mineral, people living near large deposits in hilly or mountainous regions also face possible exposure. Minimal amounts of the mineral can fill the air in these regions, but environmental exposure is most dangerous near former asbestos mines. Two of the most recognized cities for asbestos exposure problems are Libby, Montana, and El Dorado Hills, California. Libby was home to a vermiculite mine contaminated by naturally occurring asbestos. The mine, controlled by W.R. Grace & Company and operated from 1923 to 1990, is responsible for hundreds of asbestos-related deaths. In June 2009, the U.S. Environmental Protection Agency (EPA) declared a public health emergency in Libby. In El Dorado Hills, the EPA said asbestos levels were “of concern,” according to the agency’s report on the 400-plus air samples gathered there in 2004. Although asbestos mines no longer operate in the U.S., people living near defunct mines continue to develop mesothelioma. In February 2015, reports of exposure to naturally occurring asbestos in southern Nevada made national headlines. Geologists found asbestos in 150 soil samples from Nevada and Arizona, and epidemiology research showed an increased incidence of mesothelioma in the area sampled. Geologists suspect natural erosion and commercial development of asbestos-contaminated land sent asbestos fibers airborne. Geological studies show the asbestos in Nevada is much like the asbestos found in Libby. Officials in Nevada responded by taking measures to protect workers on projects that involve areas contaminated with asbestos. The best way to prevent mesothelioma is to follow workplace safety regulations. Be cautious of materials in old homes that may contain asbestos. If you think a past job or home repair project exposed you to asbestos, you should seek regular medical exams to check for signs of asbestos-related diseases. If you or a loved one has a history of asbestos exposure — especially in the workplace — don’t wait for symptoms to arise. Instead, be proactive and talk to your doctor. Early detection offers the best opportunity for effective treatment. Karen Selby joined Asbestos.com in 2009. She is a registered nurse with a background in oncology and thoracic surgery and was the regional director of a tissue bank before becoming a Patient Advocate at The Mesothelioma Center. Karen has assisted surgeons with thoracic surgeries such as lung resections, lung transplants, pneumonectomies, pleurectomies and wedge resections. She is also a member of the Academy of Oncology Nurse & Patient Navigators. Dodson, R., & Hammar, S. Asbestos: Risk Assessment, Epidemiology, and Health Effects. Taylor & Francis: Boca Raton, 2012. Castleman, B. Asbestos: Medical and Legal Aspects. Aspen Publishers: New York, 2005. Webster, P. White Dust Black Death. Trafford: Canada, 2005. Carbone, M., & Yang, H. (2012). Molecular pathways: Targeting mechanisms of asbestos and erionite carcinogenesis in mesothelioma. Clin Cancer Res., 18(3), 598-604. doi: 10.1158/1078-0432.CCR-11-2259. How did this article help you? What about this article isn’t helpful for you? Thank you for your feedback. Would you like to speak with a Patient Advocate? Our fact-checking process begins with a thorough review of all sources to ensure they are high quality. Then we cross-check the facts with original medical or scientific reports published by those sources, or we validate the facts with reputable news organizations, medical and scientific experts and other health experts. Each page includes all sources for full transparency.